Studie R. Čecha a M. Kubáta s názvem Morphological Richness of Text vyšla v rámci kolektivní monografie Taming the Corpus. From Inflection and Lexis to Interpretation v prestižním nakladatelství Springer. This study proposes a method for measuring the morphological richness of text. 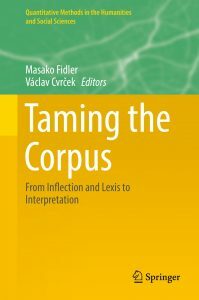 The method enables us to characterize the morphological complexity of a text (or a corpus). It is based on a computation of the difference between two measurements — the vocabulary richness of lemmas and the vocabulary richness of word forms. The greater the difference, the higher the morphological complexity of a text. The Moving Average Type Token Ratio (MATTR) is used for the computation of vocabulary richness. We hypothesize that the proposed indicator, known as Moving Average Morphological Richness (MAMR), should reflect the style of a text, and could therefore be used in stylometry. To verify this assumption, MAMR is applied in analyses of both genre and authorship.